The first day of the Triduum. But, no matter the term used, it’s a high holy day, and it’s one of the ones that is rich and complex and beautiful and difficult all at the same time. Tonight the Mass remembers that special Passover supper, the last supper. This is the supper of the institution of the Eucharist. The disciples didn’t even really realize what was going on…how typical, then, and now. But, oh the beauty of it all. painting by Juan De (Vicente) Juanes (Masip). 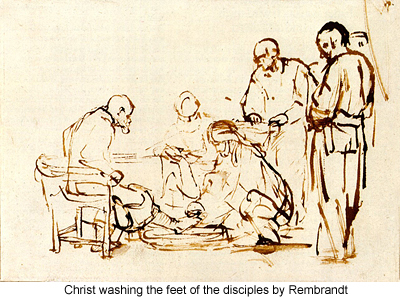 So too, this night, Christ washed their feet, showing them how to be the servant of servants that they would be called to be…that we are called to be. How often do I forget that one? Daily, how many times a day is the better question. Sigh. This is such a complex layered night. I can’t begin to do it justice. The emotions range all over the map: from the quiet humbling of the washing of the feet, to the beauty of the institution of the eucharist, to the stripping of the altar and processing out that brings me to blinking away the tears…..It’s a rigorous beautiful piercing night. For me, this night does begin the vigil…the vigil that doesn’t end until the close of Saturday night’s vigil Mass (finishing Sunday). This is one of the Passover questions. So too, it is our question, mine. And these three days ahead, I get to ponder it and pray over it and grow my heart bigger to answer it well, or try. There is placed in the sanctuary, near the altar, a large triangular candlestick holding fifteen candles. At the end of each psalm or canticle, one of these fifteen candles is extinguished, but the one which is placed at the top of the triangle is left lighted. During the singing of the Benedictus (the Canticle of Zachary at the end of Lauds), six other candles on the altar are also put out. Then the master of ceremonies takes the lighted candle from the triangle and holds it upon the altar while the choir repeats the antiphon after the canticle, after which she hides it behind the altar during the recitation of the Christus antiphon and final prayer. As soon as this prayer is finished, a noise is made with the seats of the stalls in the choir, which continues until the candle is brought from behind the altar, and shows, by its light, that the Office of Tenebrae is over. Wishing you a mindful and Blessed Triduum. This entry was posted in Easter, liturgical year, triduum by coffeemom. Bookmark the permalink. >For our church, this has been Sabbath Week. A chance to draw close to the Lord and remember what He has done for us. All of the weekly activities have been cancelled and we've been encouraged to hold family devotions, eat dinner together, etc. Tonight our family watched The Passion of the Christ. It brought home my need for repentance. To confess my sins and humble myself before the Lord. He's done so much for me.Such an amazing time of year. I hope you have a very blessed Easter.